The company Everix opened in 2011 and it targeted "the Photo Mess", something I have in my digital lifestyle. I have very valuable photo collections but they span five hard drives and three cloud services. Everpix offered to help me solve my digital clutter and its startup engineering pulled down $2.3M in angel and VC funding. The money didn't stretch far enough. According to the Everpix team, "After two years of research and product development, and although having a very enthusiastic user base of early adopters combined with strong PR momentum, we didn't succeed in raising our Series A in the highly competitive VC funding market. Unable to continue operating our business, we had to announce our upcoming shutdown on November 5th, 2013". But there's more--much more--because Everpix released a very powerful set of metrics that all start-ups could leverage. At the time of its shutdown announcement, the Everpix platform had 50,000 signed up users (including 7,000 subscribers) with 400 millions photos imported, while generating subscription sales of $40,000 / month during the last 3 months (i.e. enough money to cover variable costs, but not the fixed costs of the business). 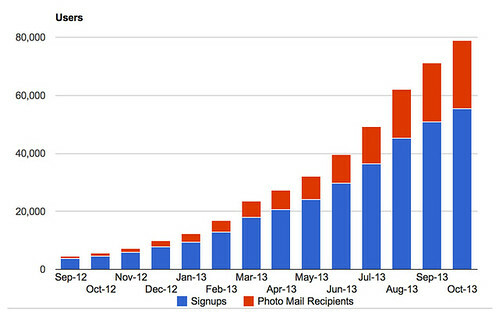 Everpix shared its high-level metrics from September 2012, with the launch of paid subscriptions, to October 2013, the last month before the Everpix shutdown announcement. This is a significant dataset of hundreds of files covering all aspects of business. This rare and uncensored inside look at the internals of a startup will benefit the startup community. The metrics in the dataset were "frozen" as of November 6th, 2013 (the day following the announcement of Everpix's shutdown) and represent more than 90% of all available Everpix metrics. Only metrics covered by NDAs with partners or metrics exposing identifiable Everpix users information have been omitted.